The new Facebook profile introduces a stream of five photos that is displayed at the top of user profile. The photo streams consists of most recently tagged photos or photos from profile picture album of the user. Recently tagged photos will be shown and visible to the people selected in the “Photos and videos you’re tagged in” privacy setting (which Facebook recommends to set as Friends of Friends), or photos from the profile picture album will be shown and displayed to people who are not allowed to view your tagged photos, but allowed to see profile picture album. There is no global switch or option to disable and remove the photos at the top of the profile. However, it’s possible to remove and prevent a specific photo from appearing at the top of Facebook new profile. Useful to remove and clean the photos from any wrongly untagged images, pictures of spam nature, or simply photos that you don’t want others to see directly on Profile page. To remove and hide a photo from the top of the Facebook profile, roll over the photo and click the “x” that floats in the top-right corner. The photo will be instantly removed and hidden from view. Note that the trick will not delete the photo from your Facebook account. The photo can still be found and seen on your photos page. Alternatively, just change the Privacy Settings so that nobody (or only selected people or friends) can see the tagged photos at the top of the profile. 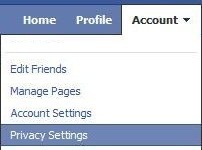 Choose the “Privacy Settings” option in the Account drop-down menu at the top of any Facebook page. Select “Customize Settings” in the “Sharing on Facebook” section. Click on “Edit Settings” for “Photos and videos I’m tagged in”. Select the new privacy settings for “Who can see photos and videos I’m tagged in” from the drop-down list. Options available are Everyone, Friends of Friends, Friends Only and Customize (for making visible to specific friends or only me, or hide from specific friends). Click “Okay” or “Save Setting” when done. Tip: If you don’t want any photos to display on top of profile to anybody (completely remove the photos bar on top of the profile), set the Privacy Settings above to “Only Me” for “Make this visible to” when inside the “Customize” option. Then, go to “Edit album privacy for existing photos” on Privacy Settings page, and change the setting of “Profile Pictures” to “Customize”, and select “Only Me” under “Make this visible to” too (or any other options as prefer). The downside is that nobody will see your profile picture everywhere.